OK, so everyone had a chuckle and some fun over the Cisewu Tiger. And rightly so because it looks like the sculptor was smoking something illegal that the police confiscated when fashioning his magnum opus. But as usual, people miss asking the right questions when it comes to such stories. Who was the sculptor and what’s his claim to fame if not being the relative of some high ranking military man? Who in the military commissioned the sculptor? How is it that presumably sensible military commanders could approve this comical sight and pay the sculptor? Could frame thy laughable symmetry? Amusement is one thing you might rarely find in a military base. 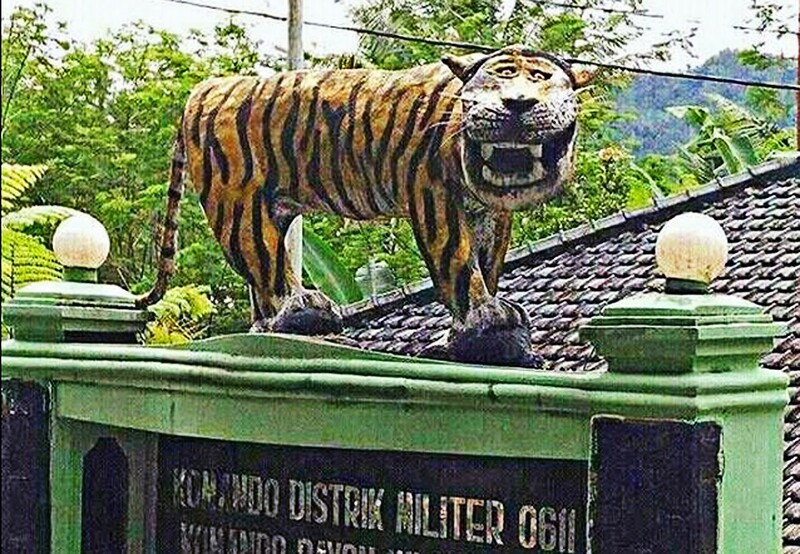 But this was not the case at the Subdistrict Military Command (Koramil) 1123 in Cisewu, West Java, when a smiling tiger statue at the base generated laughter and glee around the country. On Monday, however, the odd-looking statue located at the base’s main entrance was taken down into pieces. The tiger is the symbol of the Siliwangi Military Command, which oversees the entire West Java province. For a few days prior to Monday, netizens shared the hashtag #MacanCisewu (Cisewu Tiger), with the picture of the statue going viral. With its wide smile, the tiger would surely put a smile on the face of any visitor to the base. Social media users had every reason to post hilarious comments on the statue, but high-ranking military officers felt irritated by the online fuss. The cheeky netizens were deemed bullies by the military and alas, the military eventually decided to dismantle the tiger.